Looking for a spacious, move-in ready home in a popular, quiet, convenient Bloomfield neighborhood? 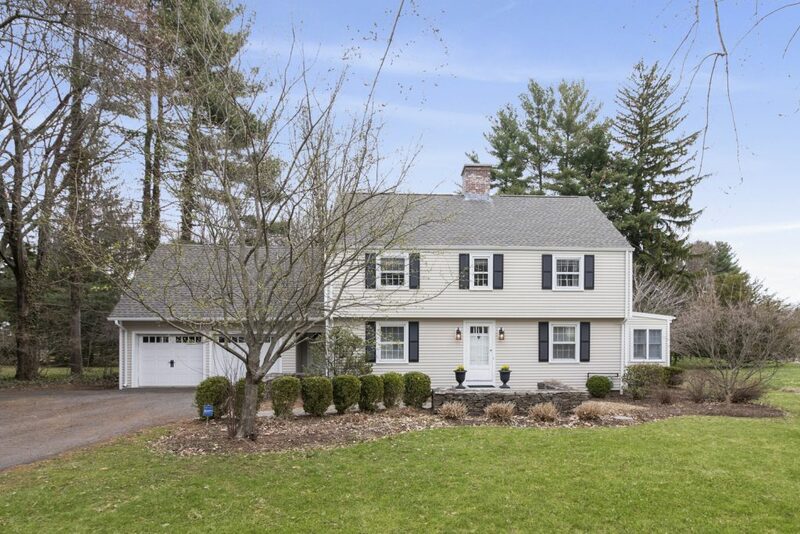 4 Kenwood Circle is the perfect Colonial for you. Curb appeal abounds with the nicely manicured lot featuring mature plantings, stone walls, and a curved slate front walkway. Inside, you’ll find stained oak hardwood floors, contemporary paint colors, and lots of natural light. The living room features a beautifully tiled gas fireplace with handsome mantel, built-in book shelves, and French doors that lead to the backyard. The adjacent four-season sunroom is a cheerful space, the perfect place to stretch out and relax. An updated kitchen with granite counters, stainless steel appliances, and eat-in space offers plenty of work area and storage. The pass through between the kitchen and formal dining room connects the rooms and makes for easy entertaining. A powder room completes the first level. Upstairs, the oversized master bedroom features an en-suite bathroom and walk-in closet. There are three additional bedrooms, all nicely sized, with lots of closet storage. Outside, a level backyard has space for gardening and play, and a paver patio with room to grill and relax. An attached shed neatly stores your yard items. The home has an attached 2-car garage, new vinyl siding, a new roof, a newer Buderus high efficiency gas boiler, and gas hot water heat. It’s on public water and sewer and located close to shopping and highway access. 4 Kenwood Circle is offered at $320,000. If you’d like to see this home, please have your agent arrange a showing or call Amy at 860-655-2125 to schedule a visit. More details are available.